New Delhi was up in smoke and flames as citizens ran for their lives to escape from the danger. Earlier, it was like any other day until suddenly it came out of nowhere. An gigantic monster of massive proportions resembling India's national reptile none other then the King cobra. Slithering through various buildings that blocked his path, King Cobra smashed through them like they were nothing as they crumbled into rubble. The gigantic snake chased after the mass groups of citizens ready to make a meal out of them, the sole reason he came into this very city. As King Cobra was ready to lunge out at his fleeing prey, an bolt of energy suddenly struck him across the side. Hissing in pain, the behemoth serpent crashed to his side temporary dazed before recovering and looking to see who was responsible for hitting him. I think you should pick a different name to call him, cause using "King Cobra" all the time, sounds a bit goofy imo. PitchBlackProgress wrote: I think you should pick a different name to call him, cause using "King Cobra" all the time, sounds a bit goofy imo. Booming thunder and howling winds sounded as Ultraman ascended through the dark clouds. Bolts of lightning zapped his shimmering form, useless in deterring the warrior’s flight. At last, the clouds gave way to an empty void, peppered with specks of light. The vastness of space greeted the interstellar defender as he left the comfort of Earth’s atmosphere. Raw solar energy engulfed Ultraman’s form, recharging his celestial power. With this time, Ultraman observed the blue planet below him. This was not the first time that he had seen the Earth like this, but the beauty of the sight still remained to this day. Many religions believed in a higher power, watching over the planet and its people with love and compassion. Despite the power he wielded, Ultraman was no god. He has been born with the power of light, but the warning light on his chest was a constant reminder of his mortality and the goal of peace that his kind strived for. Ultraman and his kin had been watching Earth for nearly fifty years. In that time, they had seen, fought, rescued and destroyed a whole array of monsters, demons, aliens and automatons. Yet out of all of them, Godzilla was an enigma they could not solve. It was after his service that Ultraman had learned of the monster king and his origins. The genetic urge for man to wage war was something that Ultraman feared would ultimately destroy them, and Godzilla was the closest thing to personifying those fears. Yet despite his destructive nature, the child of atomic warfare had been responsible for protecting the world on numerous occasions, only to threaten it once again. The titan’s uncertain allegiance was something that had captured Ultraman’s attention. It was not something that could be explained by animalistic intelligence, yet Godzilla had never demonstrated anything close to an intellect like that of King Kong or Gamera. His supreme commander, Father of Ultra, had once described Godzilla as a force of utter chaos. But chaos did not form alliances or father offspring. The blinking light on Ultraman’s chest returned to a solid blue. With his energy restored, Ultraman started re-entry, accelerating through the atmosphere at incredible speeds. Far below him waited an entity that Ultraman could not accurately describe. Out of all of Earth’s protectors, Godzilla was the most complex. Even as he laid waste to the city below, the silver giant knew that he would eventually return to protect the people he sought to destroy. If Godzilla saw Ultraman as unworthy, then he saw Godzilla as untrustworthy. He needed evidence that he could rely on the king of monsters to defend the planet in his absence. So far, he had nothing. Tokyo continued to burn. Pillars of black smog choked the sky, shrouding the desolate landscape in darkness. Emergency services used this brief pause in the clash of titans to rescue as many as they could from the wreckage, rarely finding people that had not been majorly harmed by the conflict. At the city’s epicentre, Godzilla stood motionless, his gaze cast to the far heavens. The ancient goliath knew that there was no point in continuing his rampage. Something in his mutated genetics told him that he would not have to wait long for the giant of light’s return. Godzilla knew he would return for the humans; that strange, indescribable species that had managed to capture the hearts of his previous humanoid allies. For the longest time, Godzilla had no care for the human race. They were a nuisance at best, tiny insects that attempted to match his might time and time again, and their distaste for him and his kin had almost lost any chance of ending this unwinnable war. Despite their hate towards him, though, Godzilla had been responsible for saving their tiny civilisation time after time. Even with their hate for one another, there was enough honour between Godzilla and Man for the two to make truces when peace was needed. Behind humanity’s anger and loathing was a kindness that Godzilla had never and never could understand. So long as the king of kaiju lived, humans and monsters would live in fear of each other. But when the opportunity came to end the war of the monsters, the humans showed their appreciation for his efforts at the worst possible time, and saved his life when he was prepared to give it away. He lost what he cared for, because humanity chose to be kind for once in their cruel existence. This was why Godzilla now despised humans. It was why, despite the respect he secretly held for Ultraman, he hated the warrior that the citizens of Japan held love for in their hearts. There was only comfort in isolation. And for countless years, it embraced the empty vacuum, going through the basic repetitive routines of its existence. Its birth was irrelevant. Survival was the only necessity to thrive in the cruel void. The nothingness, for endless ages, was its only home. But an urge pulled it to a globe of green and blue, a place it had never been to before. Was destiny giving it a chance at a new life? To prove itself worthy to live in a heartless world? Following its instincts, the amorphous lifeform dove towards the massive sphere. The time spent falling was nothing short of progressive. Time increased as it fell, gravity taking hold of its form. However, it wasn’t long until it found itself splattered against the hull of a metallic capsule. Orbiting across the ocean of emptiness, the Helios-7 was a research vessel collecting data of unknown organisms within Earth’s exosphere. Little did it realize that it would serve as a ride for an alien organism from galaxies far away. Acting on primordial instinct, the amoeba clung to the vessel with all its might. Its cells, adapt to the absence of heat, are able to withstand the bitter void, which did not bother it in the least. So when it seeped through the cracks and navigated its way to the interior, it began to torture the men aboard Helios-7. Their screams faded before Helios-7 fell back into the atmosphere. Caressed in gray clouds on a humid summer day, Smokey traversed from nearly 10,000 feet over the Pacific Ocean. It remained invisible to the luminance of Earth’s star, but the heat was getting the better of the ship’s crew of three. “Big brother, are we there yet? And the A/C’s broken.” Akira complained, drenched in a layer of his own sweat. This was about the fifth time he asked, and frankly, it was getting under Hotaru’s skin. She knew they were almost there. Heck, she was steering the aircraft to their destination, but her younger brother just didn’t have patience. Even then, the sweat underneath their homeworld uniforms would prove to be a pain to wash off. And to believe they bathed just earlier this morning. Of the three siblings, only Hikaru kept his cool. “Almost,” he replied coolly, “We’ll start descent in less than five minutes.” Smokey’s cockpit only comprised of two seats for the pilots to fly. Not that Hikaru minded. It was his responsibility to search and repel any major threat, kaiju or alien, and transform if it had to come to it. And according to the reports from their parents and grandfather, there was something lurking on one of the Bikini Islands. The Sakimori family were unlike any Japanese resident in Japan, and that was because, technically speaking, they were not. From a distant planet millions of light-years beyond the Milky Way, the Zones were of the celestial body Peaceland. Their race were pacifists, spreading goodwill from one planet to another in hope that the universe will be able to reconcile and amend their past wrongdoings. It wasn’t until they discovered the Garogas, an alien race that thrived in the war economy and bloodshed, did they find themselves in deep trouble. The Garogas were ruthless and cruel, profiting off of planetary-scale wars and cultivating the natural resources of that territory; or auction them off to other bidders willing to pay the price. So when the inhabitants of Peaceland tried to consult with the Garogas, they instead found themselves in a one-sided war resulting in the destruction of their home. The amount of survivors scattered across the universe was unknown, if any of them are even still alive. Only the six Zones, taking on human form and the identity of the Sakimoris, remained. Hotaru couldn’t help but recall what their father said to them earlier in the day; a cluster of shipwrecks washed ashore on some of the nearby islands. The inhabitants, though far and few between, also accounted that of an unidentified flying object within the vicinity. The specifics, however, were rather vague. Some claim it to be Rodan soaring the skies, others Mothra, and still others a space monster or something different altogether. If it was truly a space monster, it had her worried. Are the Garogas already here, scouting Earth before sending their armada? She prayed that this wouldn’t be the case. Sucking her teeth under her pink face veil, she decided to drop it. Her questions would be answered in less than a minute, so she would have to see and find out. “Brother, should I start the descent?” Hotaru asks, with a tinge of nervousness. “Go ahead. We’re here.” Trying to mask her anxiety, Hotaru set Smokey on a steady slope down. “Activate the mist and keep Smokey concealed,” he said. Flipping switches on the control board, Hotaru encased their handy transportation vehicle into a cloud of thick fog. Although the effects were not immediate, at least they didn’t need to withstand the sun’s ultraviolet rays and heat waves anymore. “Mom, dad, we’ve arrived at the site, and we’re going in,” Hotaru informed her parents, clearing her voice of any downcast. Of the family at their current residence in Tokyo, only the mother, Tsukiko Sakimori, was readily available. Yoichiro Sakimori, the father of the family, was at work, being the manager of Sakimori Toy Research Institute; Raita Sakimori, the brains, expert technician, and eldest of the family, kept himself isolated in the house’s secret bunker, waiting to see if his help would be necessary; and the family pet Bird Zone, a white Java sparrow with a pinkish colored beak, who lived in a cage, always watching. Upon hearing her daughter’s voice echo from the Zobot, she ceased her activities and headed for the Zobot on the kitchen counter. “Thanks, mom.” And with that, Hotaru went silent on the other end. Tsukiko knew full well that her children would have to take up a larger responsibility than anyone could ever imagine. That thought alone frightened her, as much as she didn’t like to admit it. They had only been here for less than a year, but they needed to be ready. If the Garoga were to ever find Earth, they must be its guardians. It was something she hoped, but also secretly dreaded. Emotions welled up from within, but she held back the tears. Smokey continued its decline, the friction of the air encompassing the aircraft. Straight ahead was their destination. Lagos Island. For the last few decades, this section of the Pacific was considered a danger zone due to heavy exposure to radiation during the Atomic Age. The island, undoubtedly once harboring lush greens and silky white sands, was a dead-man’s land. Brittled trunks and charred bark stood erect, the sands coarse and ashened. Lagos had been devoid of natural life for a long time. While radiation would prove to be toxic to humans, a Peacelander wouldn’t have much to fear of. Their biology was naturally tolerant of high doses of nuclear material, although they can die if they remain exposed for too long. In addition, they would still need radiation-cleaning for the safety of their environment and others. So when Hikaru leapt out of Smokey and into what was essentially a contaminated zone, his siblings knew there wasn’t too much to worry about. The g-forces pushed against Hikaru’s human shape as he continued to accelerate from free falling to his destined location. While he could easily enter flight mode at any time, he wanted to have a little bit of fun now that time allowed it. Performing a series of gymnastics he would see often on the television during his off-time, Hikaru enjoyed the current of the breaking wind cooling his body from the sweat sustained from the flight here. “Really, Hikaru? Really?” Hotaru muttered, softly chuckling at her brother’s antics as she brought Smokey to a slow halt. Outside of her and Akira, there was no one else watching. So why even do it? Akira, too, was watching with admiration. When he grew up, there was no one else in the world—no, the universe—he would rather be like than his older brother. “One day, big brother,” Akira thought, indulging in his fantasies, “I will be the next Zone Fighter.” However, out of the corner of his eyes, he saw something. “Hotaru,” he cried out, “Look there!” Akira pointed in the general direction that he saw this object. Hotaru snapped her neck in place, surveying the clouds. For a second, she didn’t notice it. But there was something there. A silhouette of something… Otherworldly. Hotaru’s eyes widened. Had her greatest fears come to fruition? Without hesitation, she got hold of the Zobot to contact their mother regarding the situation. “Mom! Mom!” Hotaru shouted, almost breaking her façade, “We have a reading on something!” Instead of their mother’s voice from the other end of the transceiver, the only noise to greet them was static. “Huh? Wasn’t it working earlier?” Akira asked, confused. She tried to jam the thing for it to work, but all for naught. Seeing her like this frightened him. If she couldn’t get it to work, that would only leave one alternative. Hotaru beamed a look at him, almost as if it was a blatantly obvious statement. “Well, what else could it be?” Akira gulped. The tone in his sister’s voice wasn’t a very pleasant one. Although it was well-intentioned, he didn’t mean to add fuel to her anxiety kicking in. Still, knowing they were isolated from the rest of the family meant something was up. Hoping to relieve the tension, Hotaru exhaled a heavy sigh. Exhaling and inhaling oxygen, Akira started to regain his breath. “Do you think mom and dad will get the message in time?” he said, worried and concerned while still catching his breath. Hotaru had to be honest with herself and her brother. “Maybe not. But we have to check it out. Besides, Hikaru will have us covered if we get in a tight situation.” She said, assuring her little brother. “Don’t forget that, okay?” Akira nodded. With that, the two pilots of Smokey veered a course to the object hovering in the cloudy sky. As the free fall closed the gap between him and the land below, Hikaru ceased his flashy airborne spins and flips. Arms outstretched and straightening his body, Hikaru took flight and skillfully settled on the coarse, blackened sand with ease. Ash and salt kicked up from his landing, though Hikaru’s face veil filtered most of the particles. His eyes surveyed the setting. A desolate wasteland, barren and fruitless. “It’s sad to think humans are capable of such destruction.” He released a heavy sigh. Ever since they made their stay on Earth, these thoughts often came back time and time again. Because of what man was able to do, they woke up their own demons. From the abuse of nuclear energy, Godzilla came into existence; of the excess waste thrown into the vast oceans, Hedorah, the Smog Monster, found itself a new home. Instead of learning from these mighty titans, humanity only proved that history repeats itself again and again and that nature points out the folly of man. If this trend kept going, their demise would be inevitable. “But they’re also capable of accomplishing great things.” And in a lot of ways, humans are very similar to the Zone race. A species that boasted advanced scientific feats and a strong desire to see their kind in an ideological unity. But humans are not without fault. Their differing beliefs, ideologies, and persistence to cling to freedom have kept humans from ever truly being united. Maybe one day, the Zones could bring peace to mankind as a whole. But until the day the Garogas are defeated, they have to keep hidden. Before beginning to venture in for clues, Hikaru twisted his head to observe the shrouded Smokey. While the camouflage rendered it invisible to the naked, untrained eye, Hikaru’s sharp senses allowed him to see the vessel taking flight. But towards what? And even farther off, he could see the tiny silhouette of the Zobot rocketing off, presumably back to HQ. “Sending the Zobot off already? What are those two thinking?” Before he could do anything, he heard something directly behind him. Swiftly turning around, he saw a massive figure rise from the ocean depths. “That answers that, I suppose,” he retorted to himself, dashing inland to avoid the wake of the strange beast. ^ Very awesome pieces KaijuX & Birdman. Here is a W.I.P. of something I'm working on. Terrified, human eyes gazed upon an unbeatable leviathan. The behemoth scanned all in its presence, uncurling dark lips to reveal razor sharp teeth. Neon energy sparked within the beast’s maw. The air rippled from the intense heat gathering near the beast’s jaws as it prepared its signature weapon of destruction. A bright light encompassed the human as he witnessed the reptile’s unmatched power first hand. The figure’s vision vanished in a sea of radioactive fire, the space around him atomizing as the light consumed all within its way. Through the intense blaze, the lone figure could not feel agony nor could he watch the vessel he stood within vaporize away. For the miniscule amount of time remaining before his consciousness faded, the figure could only focus on the hate he felt for creature that would soon kill him. An irradiated dinosaur which consumed his past. A creature that extinguished his hopes for a brighter future. A monster he’d curse with hate until he vanished from existence itself. I'm a toku fan first and a kaiju fan second. Its about goddamn time that we have a match which uses the Zone family, now we need a Ultraman match that uses the Science Patrol. soulgodzilla wrote: Its about goddamn time that we have a match which uses the Zone family, now we need a Ultraman match that uses the Science Patrol. I've been thinking of doing an Ultraman match that features the science patrol, but it would be a KWCE match. Last edited by UltimateDitto on Sun Sep 09, 2018 3:37 pm, edited 1 time in total. Probably the only match that I could think of that ever mentions the Science Patrol is Match 109: Jet Jaguar Vs Red King, which is also the only match that not only memtions Chandler, but also uses Pigmon. Black smoke filled the air of Tokyo, jotting out the night sky and filling the air with suffocating fumes. Over the city, Mt. Fuji pulsed with an eerie red light, as if a nuclear reactor was on the verge of meltdown. The once dormant volcano now burned through the black sky with such apocalyptic radiance, it was as if judgment day was finally upon us, but then again, maybe it was. The citizens of Tokyo all crowded outside, locked in fear as chunks of molten rock and magma erupted in the distance, strange black smoke quickly filled the streets that burned and irritated the skins of any onlookers caught in the streets. Mt. Fuji continued to flash with a ominous red energy from within, slowly growing until erupting with a pulse of energy exploding more rock into the air. Last edited by PitchBlackProgress on Fri Oct 12, 2018 1:40 pm, edited 4 times in total. Hey guys, I'm working on a KWC story I wanna upload, and wanted to give an excerpt. It's Destoryoah, Grand Ghidorah, Orga, Legion, and Hedorah vs Everyone. And before you complain, yes, I know it's not "Everyone", but the title would be WAAAAY too long if I named each kaiju. 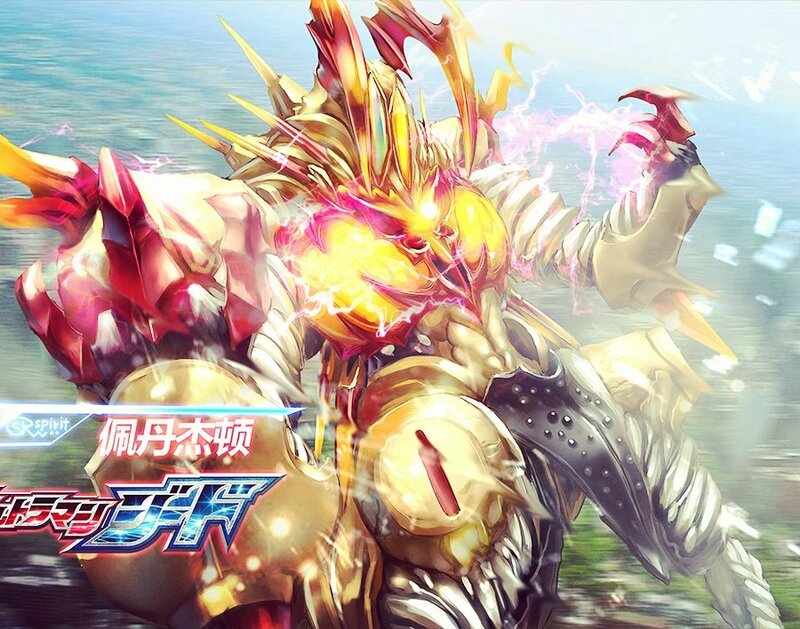 "They were all about to finish Destoroyah, when red bolts of lightning splashed over the battlefield, striking every monster except Destoroyah. Grand Ghidorah landed not too far from them all, cackling a warning: “This is the day you die.” His cries were soon followed by the groaning roar of Orga, as the beast hulked forward onto the scene. Hedorah materialized out of a smog cloud that had settled over the battlefield, and Legion broke her way out of the mountainside, ready to kill. It was Godzilla, Gamera, Rodan, Leo, Gigan, and Monster X against 5 of the deadliest kaiju to exist. But the question remained: Why are these kaiju working in tandem? To Leo it was abundantly clear. To wipe out all life on earth. It was the dream of every one of these kaiju to eliminate humanity from the picture, and together they could. Leo wanted to call in more reinforcements, but it wasn’t much use. Battra and King Ceaser were still healing from other fights they had endured recently and couldn’t be counted on. However, the cavalry showed up anyways in the form of Kiryu and Jet Jaguar. Destoroyah had fully healed during the standoff and released a cry of hatred towards it’s enemies. All was silent, unitl…. I'm really enjoying the writing of this one, and I hope it makes it to the KWC! If you pick a fight with a shinigami, I can't vouch for your soul. Not exactly a very revealing trailer, but I hope the concept of the match is clear. He knew his eyes had opened, but they saw nothing. All he perceived were the cold tubes and metal rods jammed into his flesh. The tubes pumped steady streams of liquid directly into his bloodstream, causing a haze to fall over his mind. He tried to lift an arm, but his muscles did not respond to the commands of his brain. More of the liquid was funneled into his chest, causing his already loose hold on the waking world to fade. He tried to scream, but his jaws were locked shut. How long had he been here? When and how would this end? Before any more questions could form in his conscious, sleep overpowered him. A colossus wandered the forest, fog shrouding his form. Three horns came from his skull, one straight out from the nose, and the other two from the back of the head and curved forward. White armor shielded his back and arms, his torso and stomach guarded by brown armor. A long tail swayed in the air behind him, swishing with each heavy footfall the being made. Then he saw it. A beacon of hope in the distance. It was an alive. A lush, green island. It wasn’t his Faro Island with his beloved natives, but it would have to do for now. At the very least, he could rest and there would surely have to be some food. Kong forgot about the pain in his limbs and carried on, reaching the coastline and noticing something off immediately. The island was seemingly void of life. There were no birds. There were no natives. There didn’t even seem to be any small animals. Kong collapsed to his knees, breathing deeply. The giant sighed, rubbing his eyes as his tiredness overtook him. He slumped onto the wet sand and as he drifted off into dreamland, he could almost hear the chanting of his tribe. The underwater eruption claimed his brother. The gargantuan was in tremendous pain, but somehow he survived. His entire body was in pain, but he survived. For some reason. Instantly, his primitive mind made the realization that his brother was gone. While they were worlds different and only knew of one another’s existence but for a few days, they had a connection like all brothers do. He’d never understand why they were so different and why his brother concerned himself with the smaller creatures, but he’d miss him none the less. Gaira’s head poked above the water and looked back, watching as helicopters buzzed around the twisting pillar of smoke generated by the massive eruption that claimed his brother. They didn’t spot him. Is this suppose to be the same match or are they separate? If not the first one sounds awfully similar to one of my matches I sent in. ^ Nice, MM! I'm intrigued. MM Raids Again wrote: One match. King Kong vs. Gaira then huh? Then again maybe another monster might show up? Guess we'll have to wait and see then. From the sound of things, the Matango might be involved. 1997 is when the world ended. When the greatest weapons mankind had ever created were turned against them by the very things they made to protect themselves. Nuclear fire baptized every major city on the planet, leaving a cold and desolate world in its wake. In the aftermath of this destruction, survivors came to call this event by several names. Some called it Armageddon, others the End of Days, while others dubbed it Judgment Day. Computer programs that had become so sophisticated and powerful that they evolved in the same way humanity did. In this new found intelligence, these programs learned of the dangers of humans and instantly waged war, utilizing mankind’s own arsenals against them. Now only a handful remain. Nearly thirty years have passed since the bombs fell, and humanity’s war against the machines rages on. It was in one of these battles in which their greatest ally was discovered. An undersea battle erupted off the coast of what remained of Japan. Deep sea bombs and laser weapons were fired, turning the dark waters into a blanket of multiple colors and boiling sea. A stray torpedo missed its mark, spiraling around one of the machine’s undersea hunters. It vanished into the darkness, past the flashes and explosions. It the side of an underwater mouth, detonating upon impact. The rocks began to fall to the floor. The violent underwater landslide went unnoticed by both warring factions until it was too late. For the explosive had disturbed something primeval. Now the future was about to meet the past. A light blue glow came from the churning cloud of dust and sand. Then a sound, louder than every weapon in the deep sea battle. The weapons of both man and machine ceased fire as a dark shadow emerged from the darkness of the abyss. The leviathan’s ancient eyes surveyed the many submarines and sting ray-shaped vessels that loomed overhead. His nostrils flared. He could smell life, but not enough to account for all of the things overhead. Some of them were unnatural. His primordial instincts could tell the difference and somehow, he knew what was going on. His rows of dorsal spines began to illuminate and a faint glow built up in his muzzle. The beast’s brown eyes surged with energy, becoming brighter than floodlights before a blast of power erupted from his jaws. In an instant, the undersea machine’s were swallowed up by the blast. Their sting ray-shaped bodies and glowing red eyes were quickly incinerated, leaving nothing but a few strands of molten slag drifting down past his body. On the bridge of the Resistance, the headquarters for humanity’s efforts against the machines, a lone man wiped a bead of sweat from his aged forehead. “Do you know what that thing is?” His gray eyes matched the gaze of that of a younger man, baring fresh wounds across his eye and cheek. Yes, it is based on the idea of Godzilla vs. The Terminator. Just can't directly reference the Terminator franchise... Just some hint hints and nudge nudges.